Thank You Archives - Pebbles, Inc.
Hi friends! 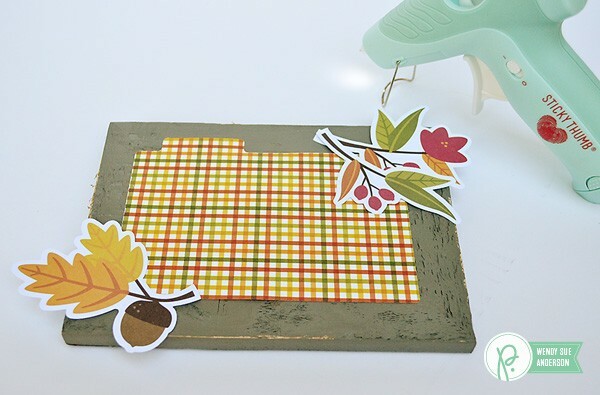 It’s Wendy Sue here today, sharing a fun little project for Teachers! I wanted to put together a little card for each of my boy’s teachers. Instead of a traditional card, I decided to create a card that doesn’t even open up! 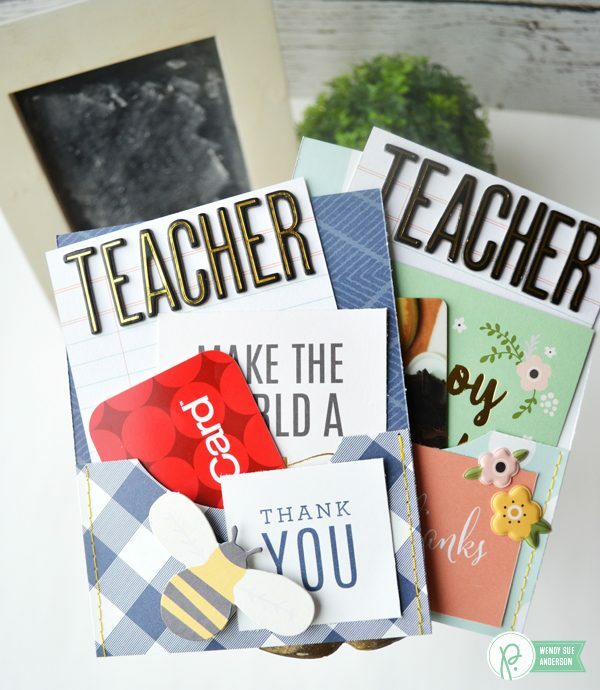 I don’t think the teachers will mind though, since the front is actually a pocket, containing a sweet note from one of their students, a little inspirational thought card, and a gift card too! 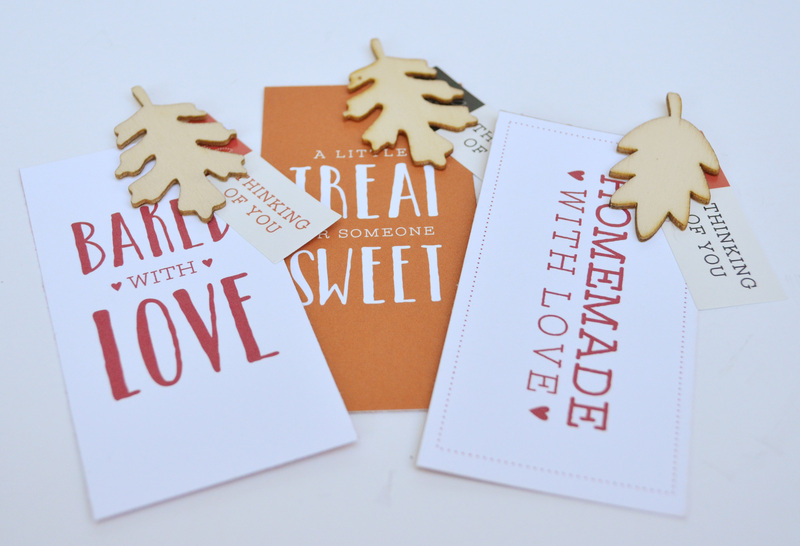 Here’s a peek at the finished cards – and keep scrolling down to see how to make these cards for yourself! 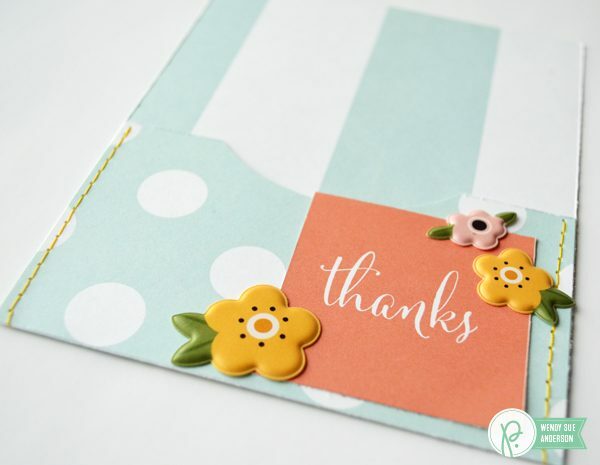 Start with a piece of 2-sided patterned paper – it’s best not to choose one with text because we’re going to flip the bottom up, which will turn the text upside down! So if you don’t want your teacher to have to stand on his head to read it, just choose two fun patterns without words. 😉 I cut mine 8″ tall and 4 1/2″ wide. Next, I scored the bottom portion so the base would be 5 1/2″ tall. 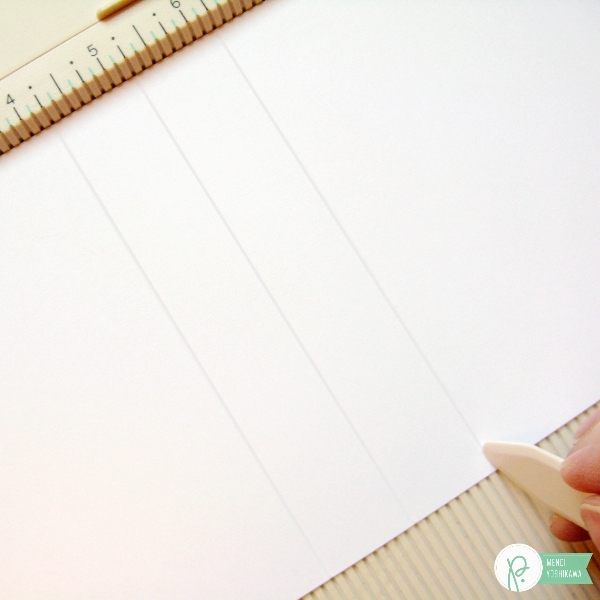 This way, if you want to add it to a traditional card base, you can easily do that! Also, I used a large (3″ circle punch) to cut a little notch out of the top of the fold-over portion. This is completely optional and won’t affect the finished product at all – it’s just for looks. Next, I pulled out my sewing machine and chose a fun yellow thread to stitch the sides of the pocket! After I added the stitches, I pulled them through to the back side and secured them with scotch tape. I forgot to take a picture, but I placed a 4 1/4″ x 5 1/2″ piece of white cardstock on the back to hide the stitches and add stability. 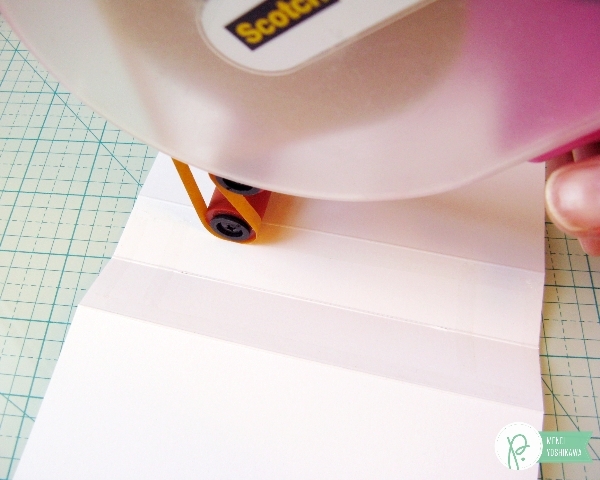 Of course, if you prefer not to use a sewing machine, you can easily use adhesive to seal up both sides of the pocket. I cut a 2″ square sentiment from patterned paper and attached it to the front of the pocket next. Then I found a fun die-cut shape and added foam adhesive to the back before adding it to the pocket. Remember the wood box I used HERE? It came with these fun little lined papers, which I thought were perfect for the kids to write a thank-you note to their teachers. 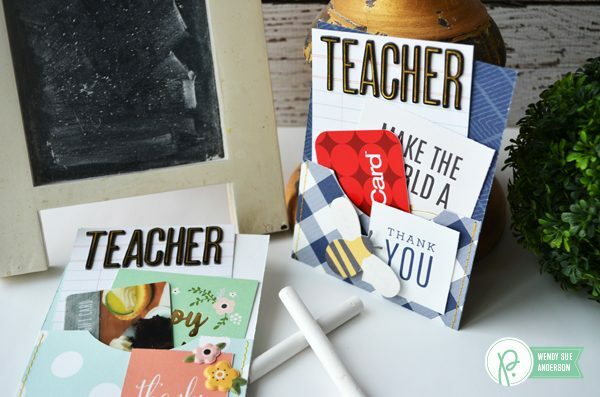 Before handing them over to the kids, I trimmed them down to fit in the pocket, then I used chipboard thickets to add “Teacher” to the top of the cards. 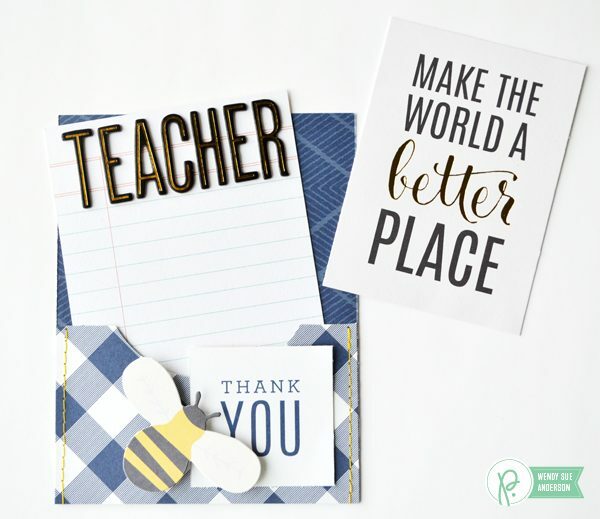 I looked through all of the awesome 3×4 cards in all of the newest collections and decided on one inspirational thought for each teacher. 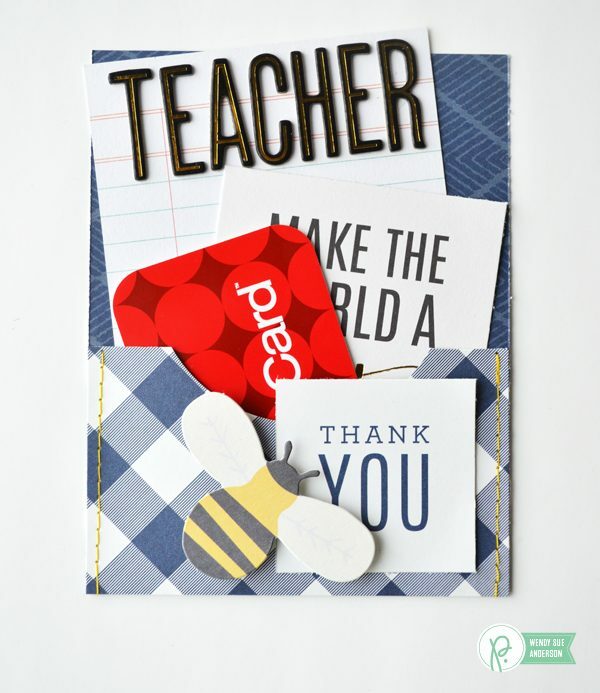 This card can easily be displayed in the classroom, if the teacher should choose to do so. 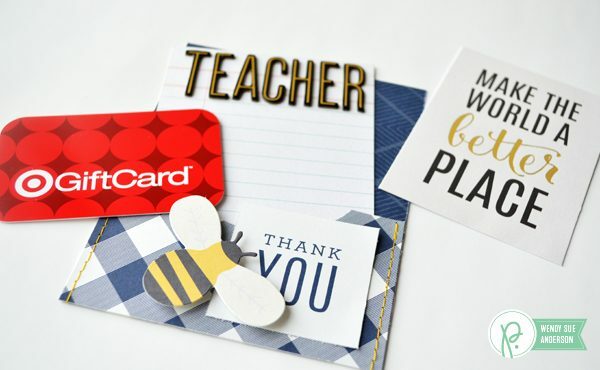 Then, of course, the gift card, which EVERY teacher appreciates! Now I just need to get my boys to write a little note and these cards are ready to go! Start with your recipe, of course. 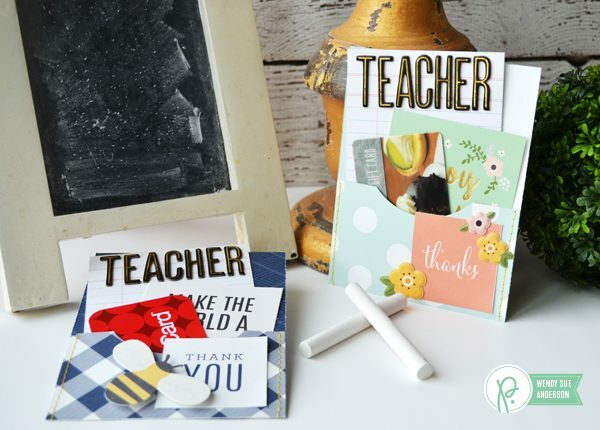 You can use your original copy if you like…or you could rewrite it on these super fun pre-printed cards with your favorite pen. I also embellished the cards a bit with fabric stickers and dimensional stickers! 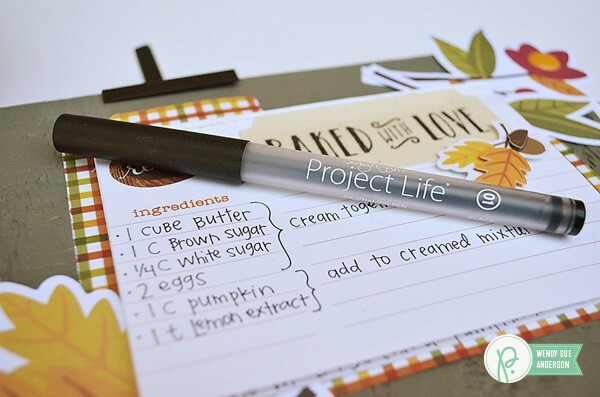 (these project life pens are my favorite – the 01 size is ideal for my journaling/recipe writing). 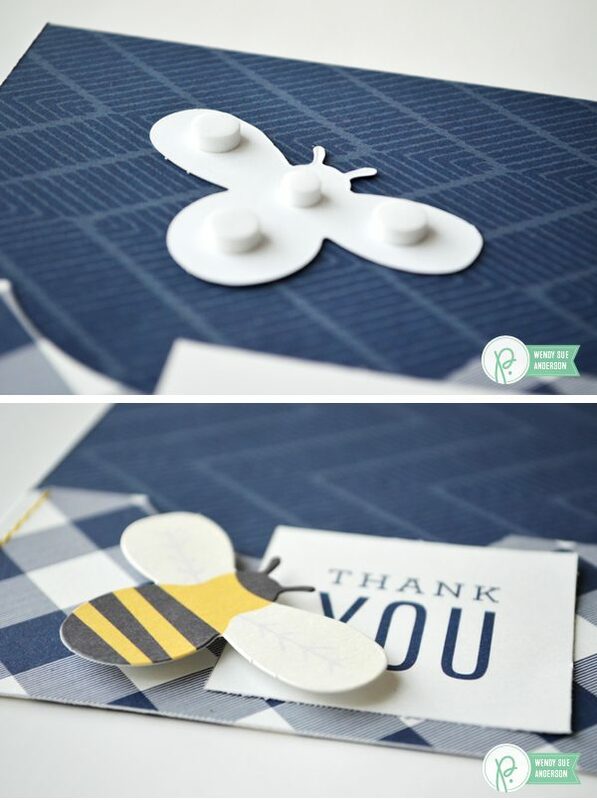 Next, use the recipe card die to cut a piece of patterned paper as the base of your project. 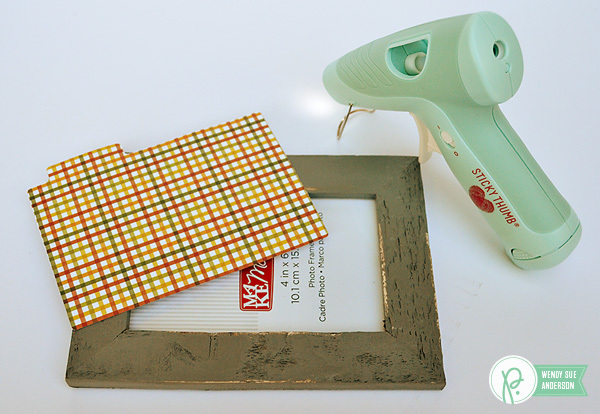 Now, you will want to use a really good, strong adhesive to add the paper to your wood frame. 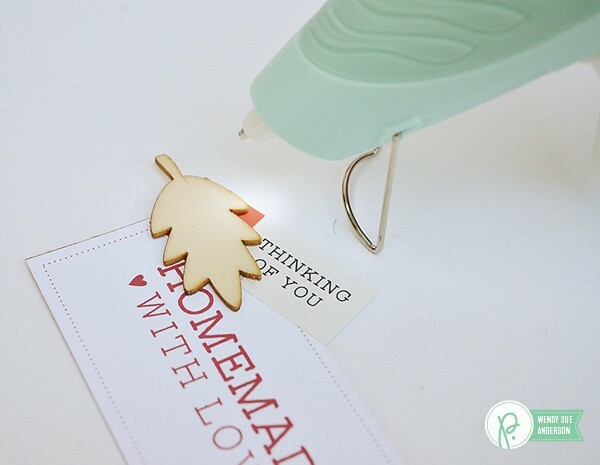 I love, love, love the new Sticky Thumb cordless hot glue gun – it’s seriously making my crafty life so much easier! 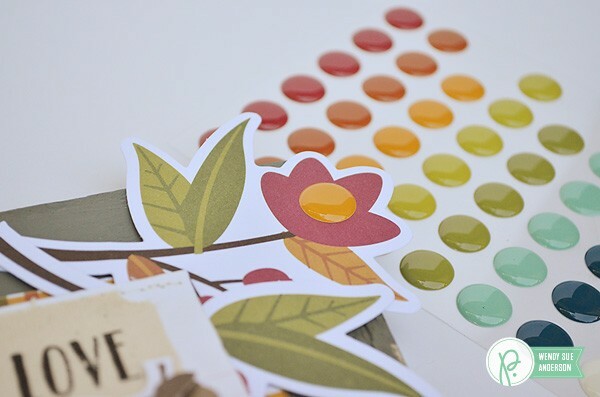 I just had to use some of these colorful dots to embellish the die cut shapes too! And now for the GIFT part of my project! 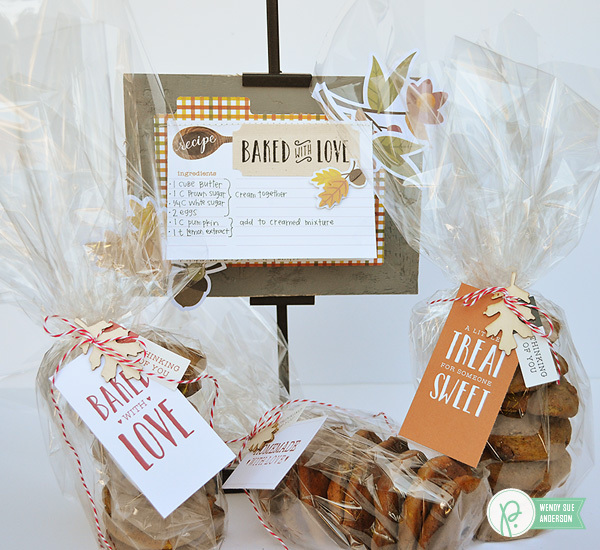 My favorite way to share cookies is stacked! 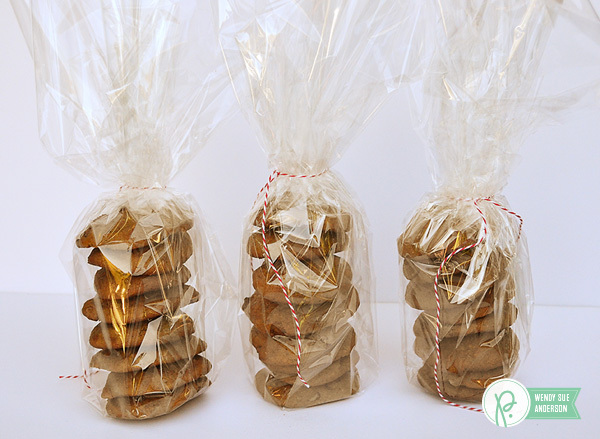 I have a huge roll of cellophane that I cut to wrap around a stack of delicious cookies – and I tie the top closed. 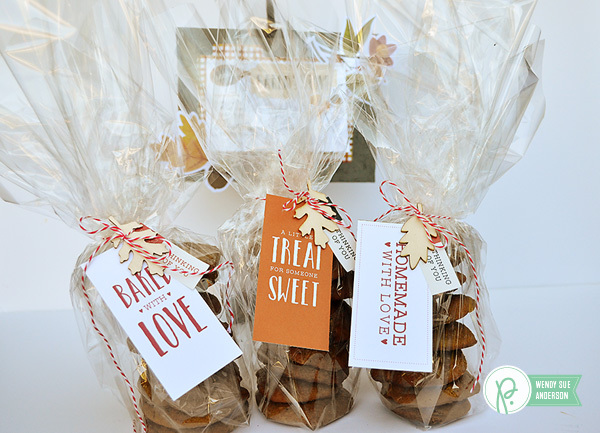 Now anyone would be happy to get these yummy cookies, just like this…but I can’t give them away quite yet. I must make them cuter! I cut out the preprinted tags from the 12×12 sheet, added a sticker, and a super fun wooden leaf. Of course, I attached the wood piece with my favorite glue! And now I’m off…because I have cookies to deliver! 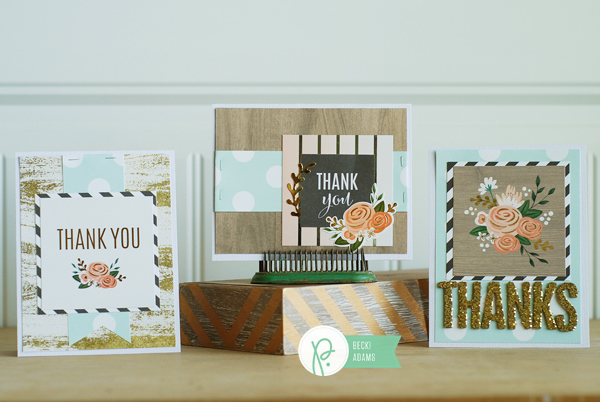 Hello Pebbles fans, Becki here, to share with you a card set I created using the brand new DIY Home collection. 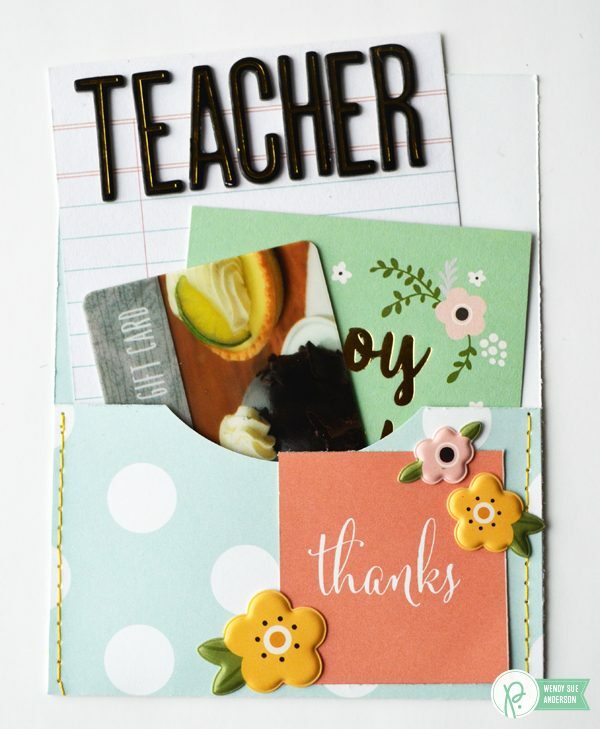 This collection is fabulous for creating cards. 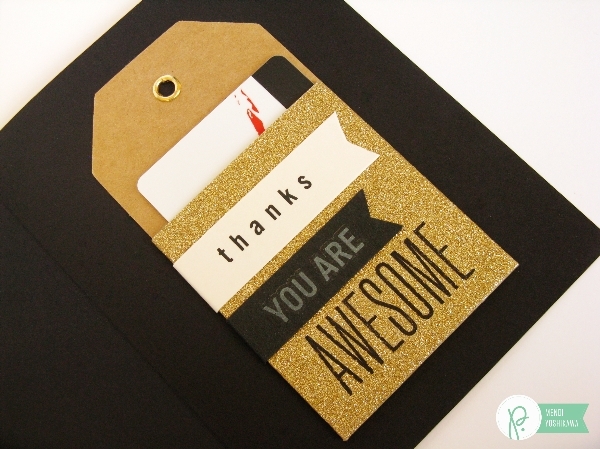 There are so many elements that are the perfect size for cards. 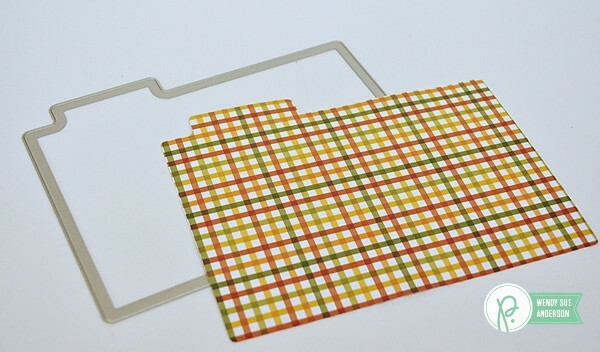 I chose to work with the 3×3 Minc card set. 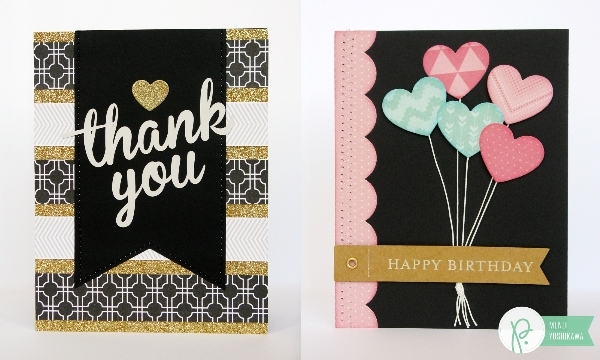 With these 3×3 cards this set of 3 Thank You cards came together in minutes. 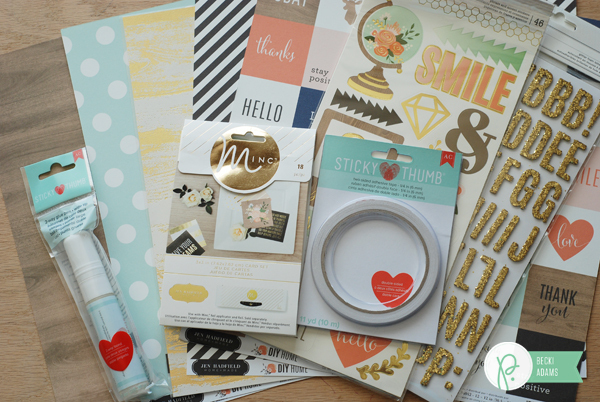 I also used stickers, patterned paper, Thickers, and the Minc machine. 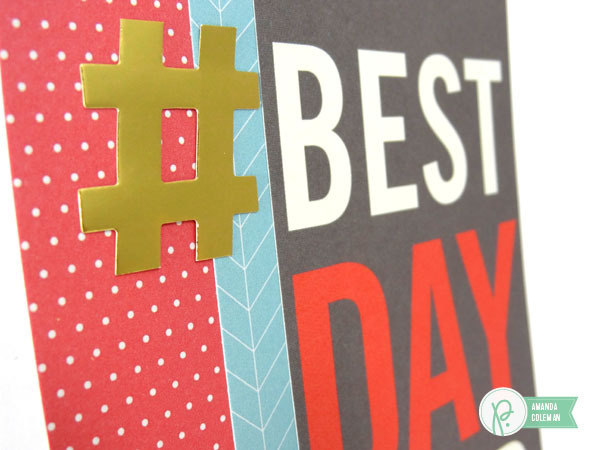 This card simply has a 3×3 Minc card layered with a little patterned paper and stickers. I added a cute gold clip at the top for a little more shine and dimension. On this card I added the “Thanks” sentiment with gold Thickers. 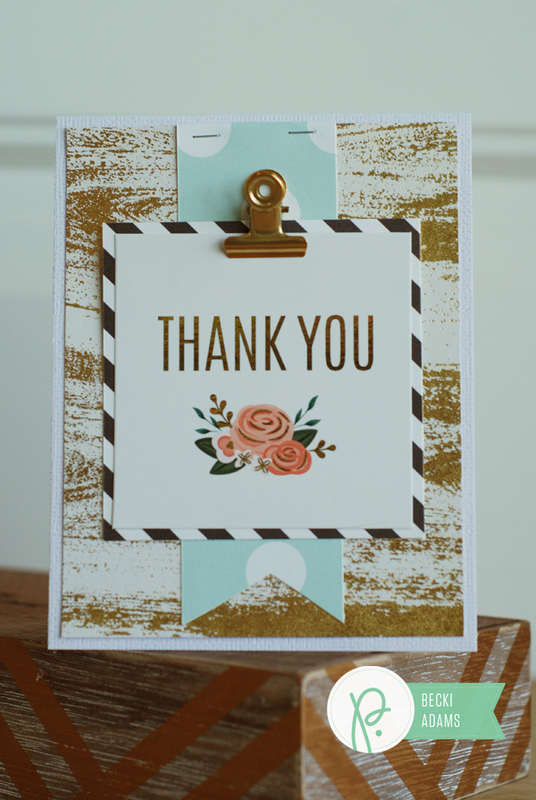 That beautiful floral card is from the Minc card set. 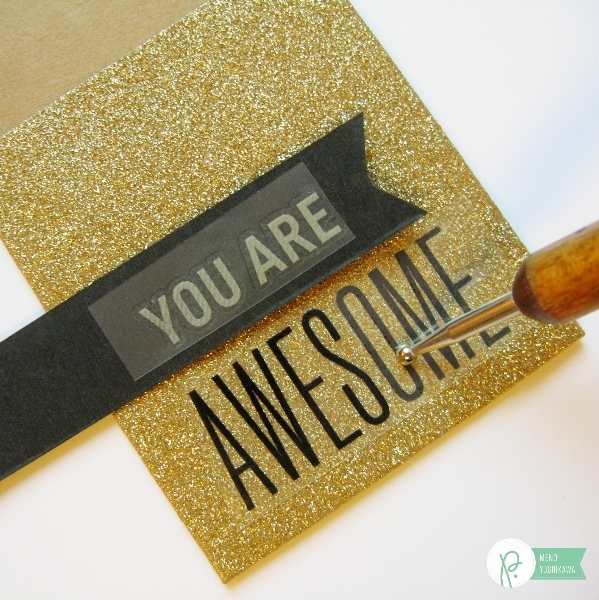 I added gold foil with the Minc machine. 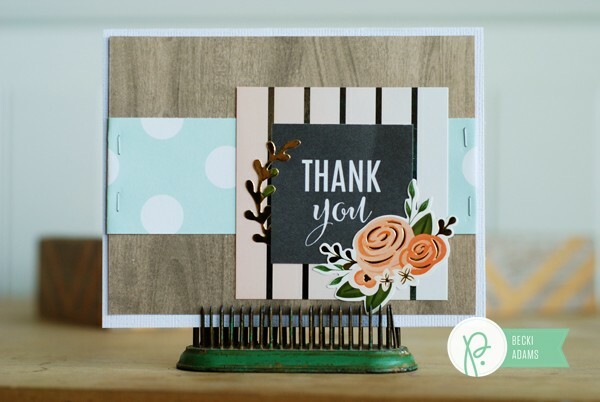 The sentiment on the last card in this set is fussy cut from the Me to You patterned paper and layered with a 3×3 card from the Minc set. What do you think? I think you’d love playing with this new collection and making your very own set of cards. Thanks for stopping by the Pebbles blog today. Hi there! 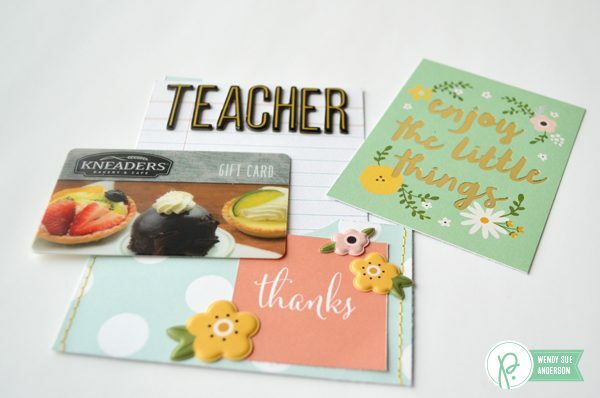 It’s Mendi here today with some fun ideas for incorporating gift cards into your card making. 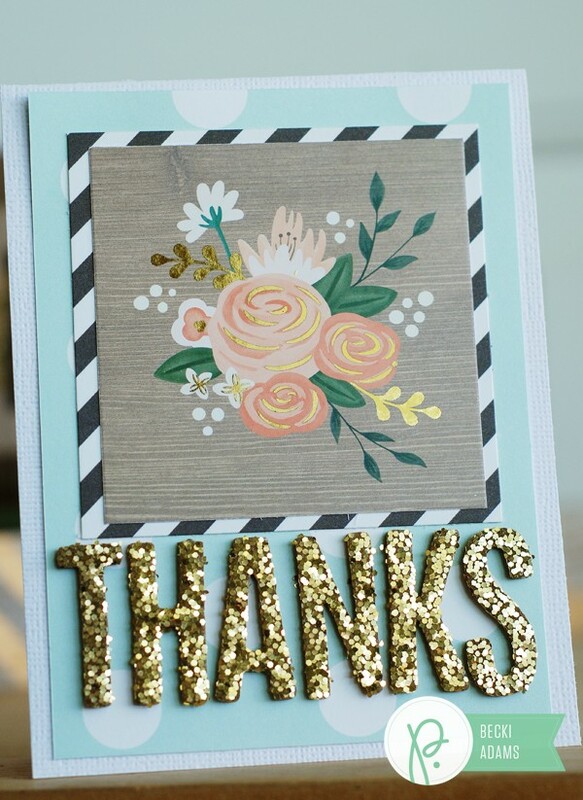 For my first card I created a background alternating stripes of gold glitter tape and 7/8″ wide strips of patterned paper from the Cottage Living 6×6 paper pad. 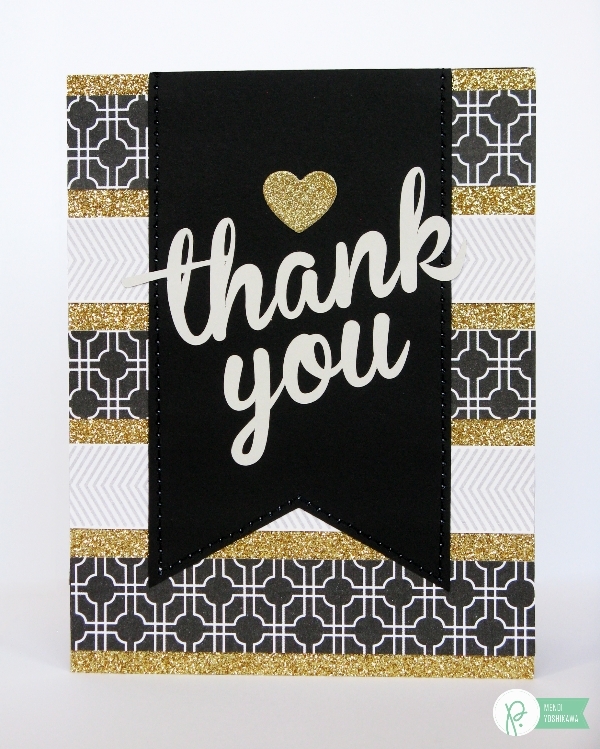 I then die cut the large pennant and “thank you” sentiment using the Brannboll font and my Silhouette die-cutting machine. To create the matching gold heart on my card front, I die cut it using the mini heart die from the Cottage Living Polaroid Die Set and some gold glitter circle stickers from the Homemade collection that were just a wee bit larger than the die. I loved how well they cut (with the acetate backing in place) and how it peeled right off and was ready to stick to my card. For the inside, I embellished the Homemade Mini Kraft Pocket Tags. These are just the perfect size to hold a gift card which is pretty awesome. To embellish the pocket with a sentiment, I pieced together two separate phrases from the Cottage Living Rub-ons & paired them Homemade Phrase Tags. 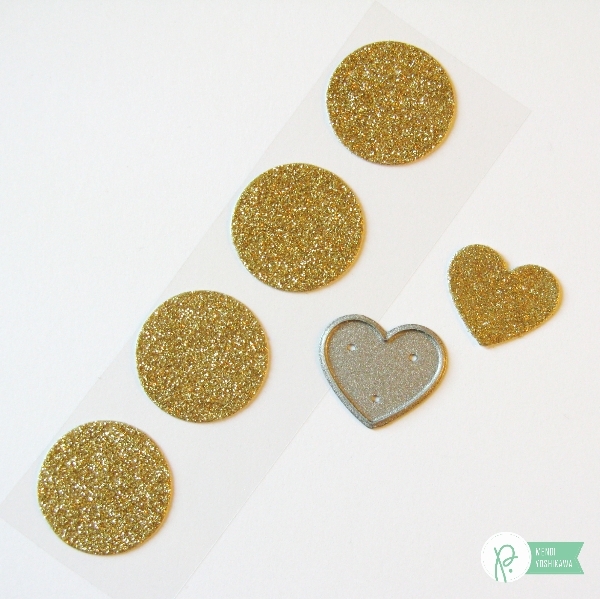 Glittered surfaces can be tricky, but these transferred pretty easily without a lot of fussing over them. I love that! 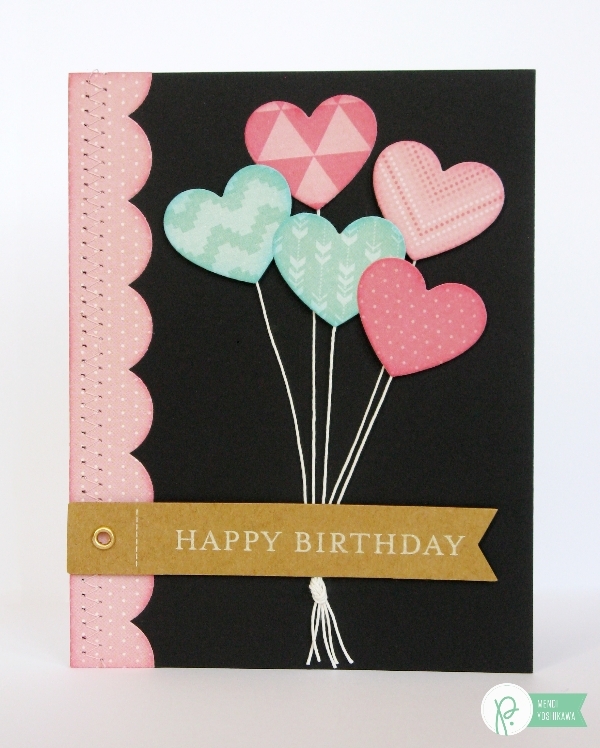 For my next card I turned heart die cuts into balloons with the help of some paper string (borrowed from those same Homemade Phrase Tags). 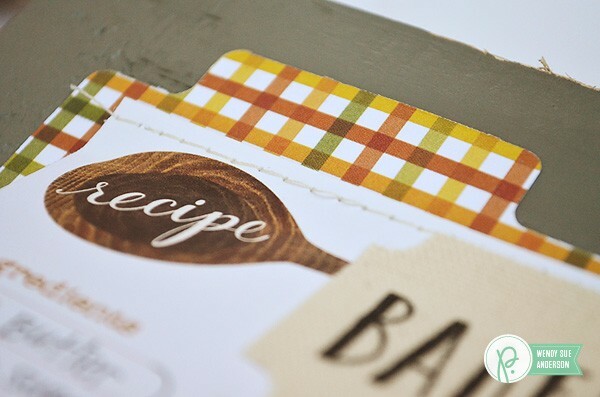 For my scalloped border I used a die from the Homemade set and hid the seam behind the kraft tag. The inside of my card features a fun fold designed to tuck a gift card into. I also cut some extra hearts to carry out my theme and make the inside as pretty as the outside. 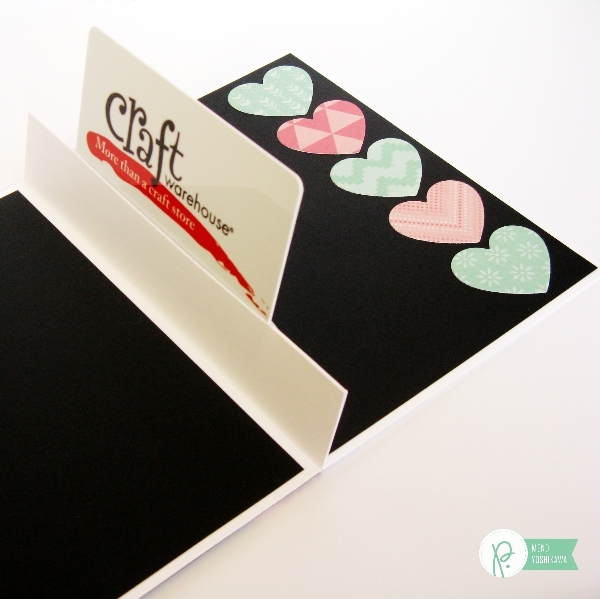 To create my card base and pocket for the gift card, I started with a 10.5″ x 5.5″ piece of cardstock. I then scored it at 4.25″, 5.25″ and 6.25″. At the center score mark, I held up the gift card as a guide and used a cutting knife along with the We R Memory Precision Glass Cutting Mat to slice a slot for the card to slip into (making it extend about 1/8 ” beyond each end of the gift card. Cutting on this glass mat is so smooth–My self healing mat has some serious competition. After cutting the slit, I then folded my cardstock accordion style and flipped it over to add adhesive down each channel created by the score marks. 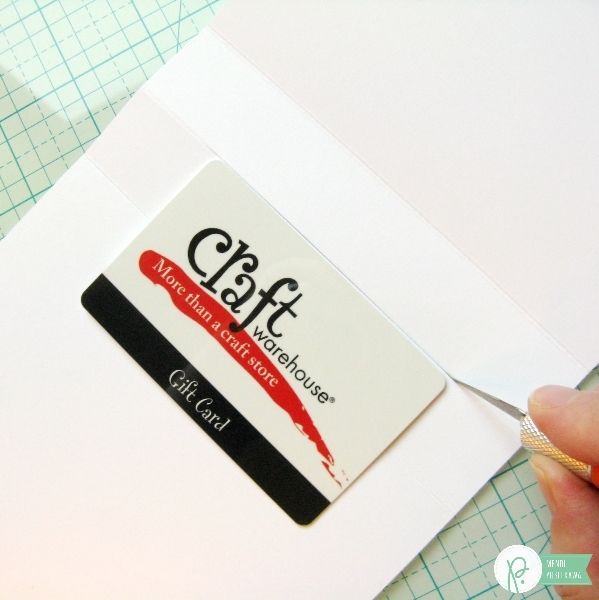 It is important to not to add adhesive at the center score mark where you have cut your slot for the gift card to slip into. To create an extra snug fit, I chose to add a line of adhesive perpendicular to my cut, just below and just above my cut line. I then simply brought the score lines together. This gave me an A2 card base ready to decorate. Here’s one last peek at my two completed cards. 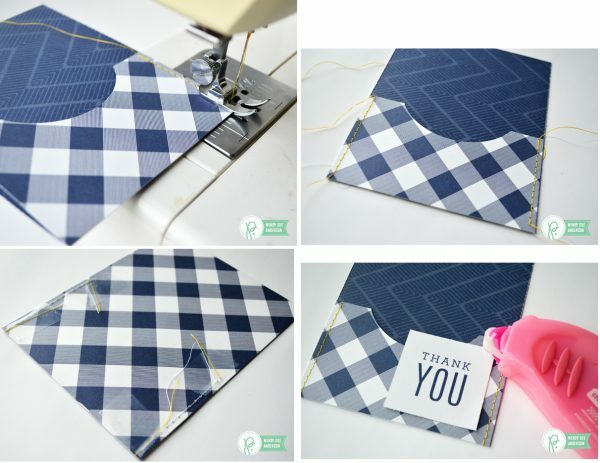 I hope I have inspired you to include some interactive gift card pockets into your upcoming projects! Falling leaves, cornucopias, sheaves of wheat, pumpkin pie, turkey, etc., etc., are what often come to mind when I think of Thanksgiving. (That’s right, I just said sheaves.) I’m a sucker for harvest icons at Thanksgiving time and can’t resist a Thanksgiving card with sheaves of wheat bundled up on the front. 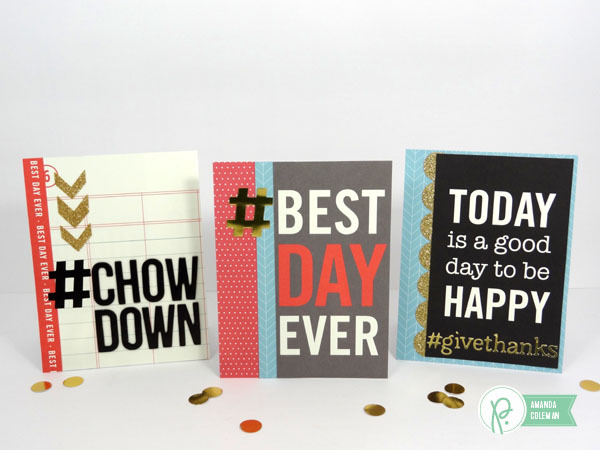 But alas, I was feeling in a playful mood and thought I would bring Thanksgiving into the modern age with a trio of fun and cute hashtag Thanksgiving cards. 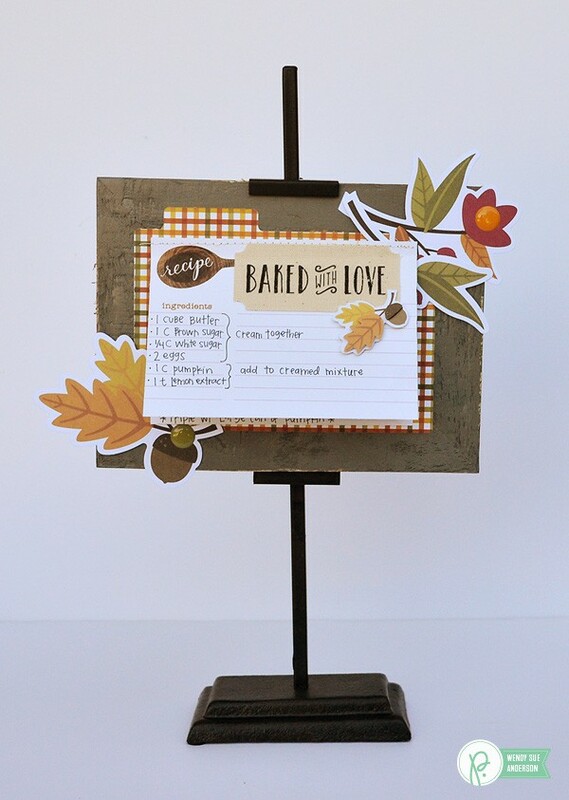 As cardmakers, it can sometimes be tricky to incorporate 4″x6″ journaling cards with “scrappy” phrases into our card making. But I discovered that with Thanksgiving in mind, almost any touchy-feely-scrapbooky phrase can be turned into a Thanksgiving phrase. Take a look at some of your journaling cards. You’ll see what I mean. 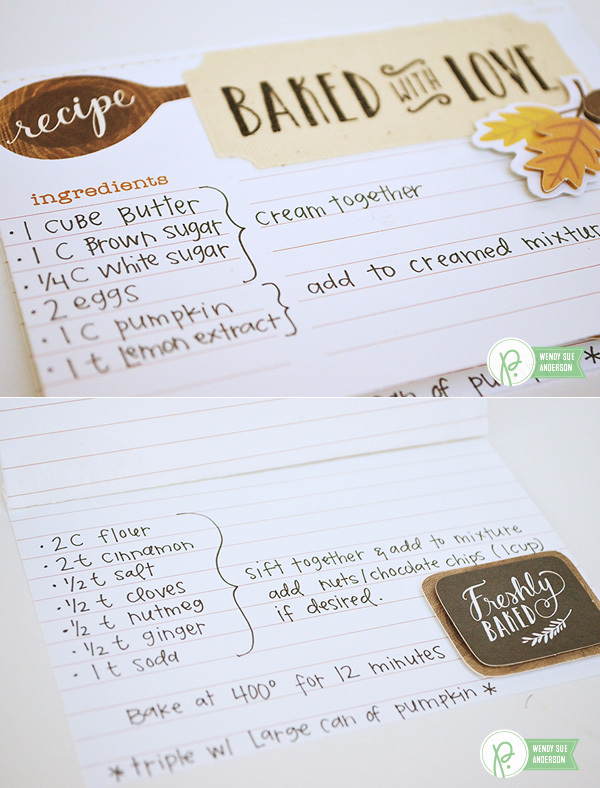 I took a couple of journaling cards from the Home+Made collection and made some fun Thanksgiving cards using hashtags to tie everything together. 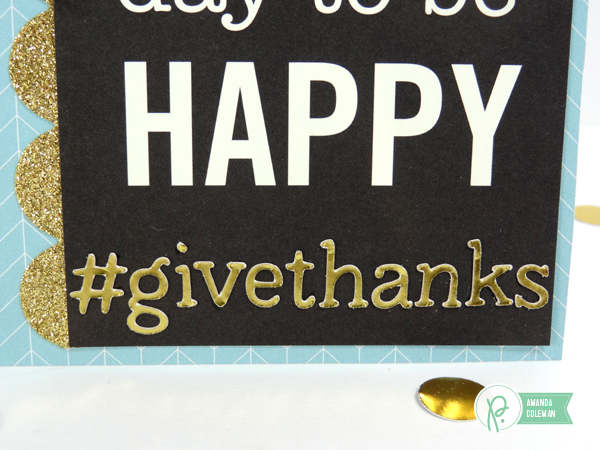 While this card could be used for any celebratory occasion, I think it makes a super fun Thanksgiving card. 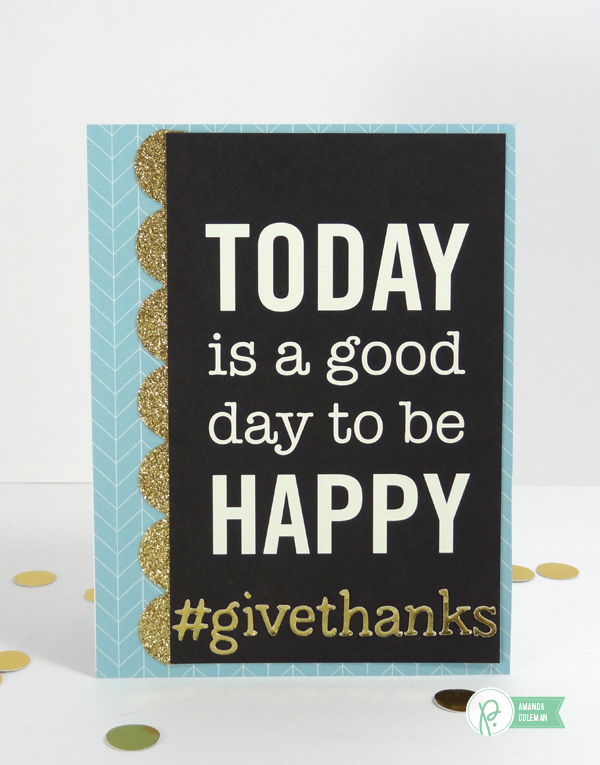 An abundant Thanksgiving feast is often anticipated and planned weeks in advance, with the expectation that it will indeed be the #bestdayever. I shortened the gold hashtag by trimming the top and the bottom by about 1/4″. This made the hashtag fit the sentiment so much better. 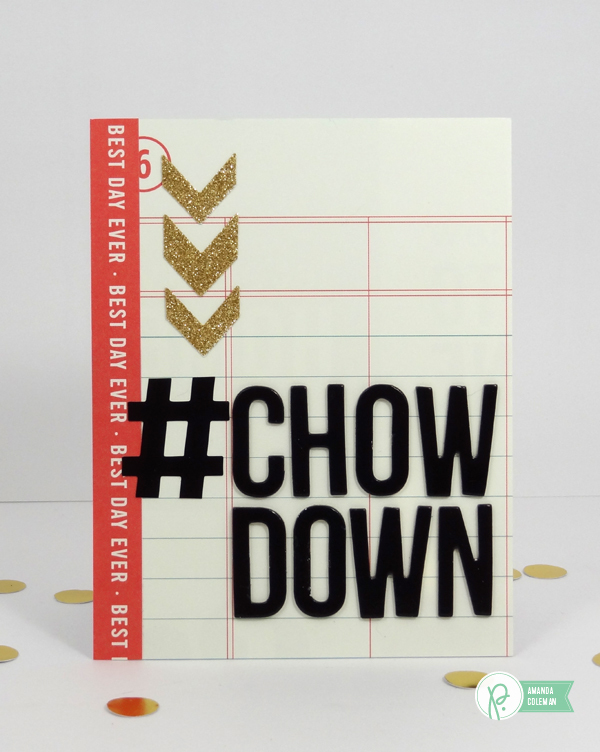 I used another large journaling card as the focal point of this card and instead of turning the entire phrase into a hashtag, I created my own hashtag by die cutting a short phrase from gold foil paper. I trimmed the journaling card a bit and layered it on top of a piece of patterned paper and gold glitter scallop tape. The gold foil paper from the Home+Made collection die cut really well. These little letters aren’t much taller than 1/4″ and they turned out perfectly on the first try. The gold foil paper is a little thicker than standard cardstock, so I used a slower cut speed and used the double cut setting. I had a lot of fun with this card. Like the gold hashtag above, I trimmed the black hashtag down a bit to better fit with the black Thickers. 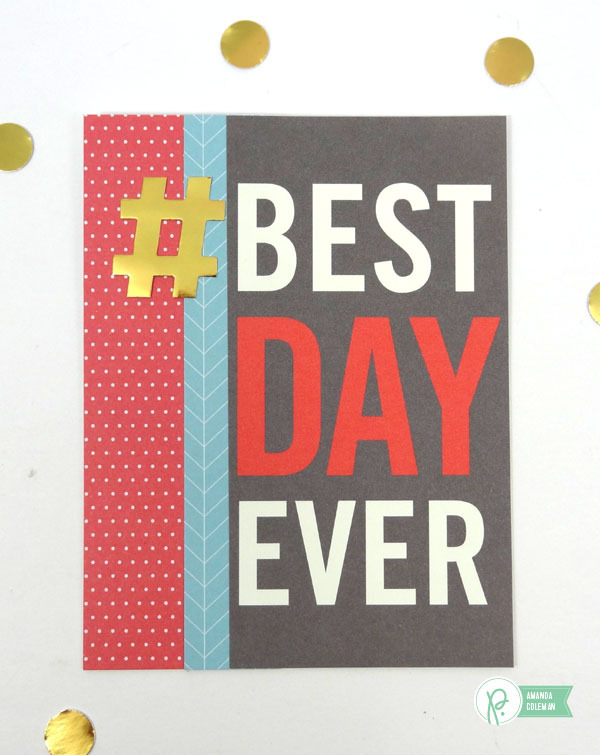 I pointed the gold glitter arrows toward the sentiment and added a fun tear strip that reads “best day ever” because Thanksgiving is, like, the best day ever. Have a fun and happy Thanksgiving!